Dee Cramer specializes in preparing budgets with 30%-60% complete drawings and bringing projects in under budget within a Cost Plus Guaranteed Maximum Price (GMP) arrangement. Cost Plus GMP utilizes the value of early involvement with Dee Cramer providing input on cost savings ideas while the A/E completes their design. Then, during the construction phase of the project, costs are tracked and are reported on a monthly basis. Many times these projects are delivered in an “open book” setting, which means the monthly detail behind the costs are shared with the GC/CM and the Owner. 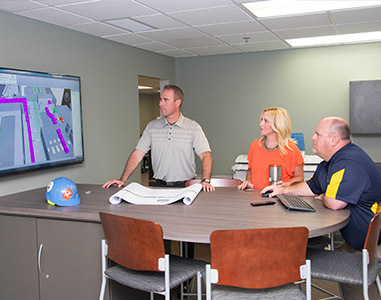 Dee Cramer has the engineering and estimating personnel to provide accurate, early, very detailed budgets and then the project execution team and processes to bring the project in within the established budget. Some prominent Cost Plus GMP projects that the company has worked on are; U of M C.S. Mott Von Voigtlander Women and Children’s Hospital, FireKeepers Casino, Dow Business Professional Service Center (BPSC) Building, Hurley Hospital ED Addition and MSU Shaw Hall Dining Room Renovation.